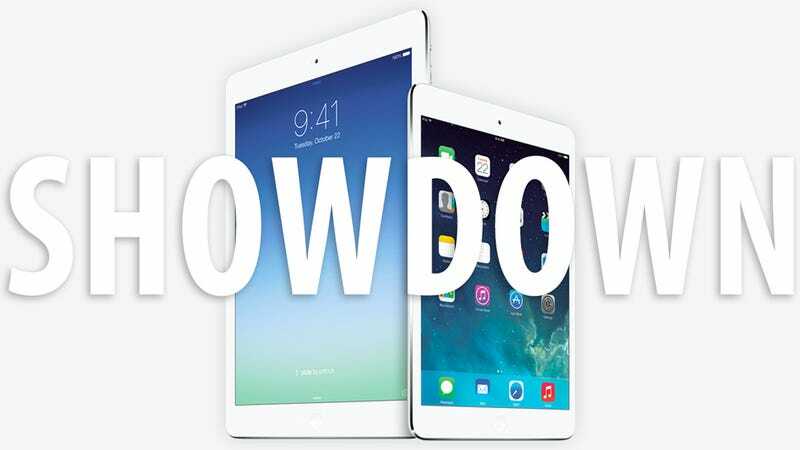 iPad Air or iPad Mini? So maybe you've considered your options, weighed the pros and cons of switching to Android, but you just know: The iPad is the tablet for you. But even if you demand iOS, both of yesterday's new versions are enticing. Are you going with the ultra-svelt iPad Air? Or should you be sticking a Retina iPad mini in your back pocket? Here's how to decide. If you plan on using your iPad as your go-to device at home, in the office, at school, and everywhere else, you're going to be carting this sucker around—a lot. And even though that sweet-sounding "Air" tacked onto the end of the 10-incher might make it seem like the slimmer, space-saving choice, that larger screen is also seriously going to cut into your carrying options. But on the other hand, if this iPad is more of a stay-in-the-closet-until-my-bi-annual-plane-flight sort of the thing, the Air will be perfectly manageable on those sporadic occasions. So if you're the kind of person who's planning on having their tablet surgically attached at the hip, the iPad mini is going to be far less of a pain-in-the-neck. But if your tablet's travel time is rare for whatever reason, might as well spring for the iPad Air. Are You a Multimedia Packrat? First of all, storage size really shouldn't be too much of an issue—everything's moving to the cloud! But old habits do die hard, and that tiny hoarder that lives in us all wants every single gig it can get its hands on. That being said, even though both tablets do hit a solid 128GB, $700 for a 7-inch tablet is leaning towards the absurd side. Plus, if you're really going to be consuming that much of what will presumably be video, music, photos, etc., the larger screen is much more appropriate for your needs. So if you're planning to use your tablet as an offline media powerhouse, the iPad Air is going to make the most sense for your packrat self both fiscally and size-wise. Do You Have Dough to Spare? Hoo boy. Let's get this out of the way, first: If you're at all strapped for cash you're looking in the wrong place. Neither of these iPads fits the traditional definition of a "good deal" unless you've scored a trade-in with an older model. Might we suggest the beautiful Nexus 7, or maybe a Kindle Fire HDX. Both are more than capable and waaaay cheaper. But if you're really married to iOS, there's only one way to go, and you need to decide how much money you wanna drop on one of these. The Retina iPad mini's starting price is $400—that's significantly more than pretty much any other 7-inch tablet on the market, so to actually bite the bullet, you're going to need to want this sucker bad. Now that's not to say the iPad Air is any sort of steal, but if you're going to be using it as a semi-regular laptop replacement, it's a bit easier to rationalize that $500 starting price, especially with the bigger screen. If you're someone with cash to burn and you truly believe it's the tablet for you, go ahead and grab an iPad mini if you have the means. But in pretty much any other situation, at least fiscally, the iPad Air makes much more sense. This one's a no-brainer. The joys of lounging around with Netflix significantly decrease when you're spending your time squinting at a smaller screen. But if you're planning to use your new tablet as an on-the-go reader or a glorified email machine that with a beautiful body and a few extra skills, you don't need the same kind of screen. So if you see yourself doing any decent amount of web-browsing, video-watching, or game-playing, and plan on using your 'pad as a glorified laptop that just moves around your home or apartment, and rarely leaves it, the iPad Air is probably more your speed. But if you're doing more word-readin', and want to do that on the go, the iPad mini might be a better bet. Or, you know, a Kindle or something.